Sara Eisen: I’m here at the U.S. chamber of commerce with managing director of the IMF, Christine Lagarde. Nice to see you again. Christine Lagarde: lovely to see you, too. Eisen: Giving her preview for the IMF meetings next week, and characterizing the global economy as in a delicate moment. What does that mean? Lagarde: it’s a delicate moment because the growth is losing momentum, and it is losing the momentum that we had hoped for pretty much across the globe. We have 70% of the global economy that is slowing down. So compared with previous forecasts, it’s clearly going to be a little bit downgraded. I think added to that, there are signs of hope coming up. So we forecast that 2019, second half, early 2020, should be a better place, but with clear downside risks, which have to do with country-specific cases – what will happen to Brexit, how will it impact the global economy, the UK economy, of course, and Europe. Tensions on trade, which clearly have resonated negatively on the confidence index of many economic operators, which is still up in the air. We have good noises, but nothing is yet certain and financial markets that are a bit jittery. They are quite positive at the moment because the financials are conducive to that. But possibly at risk of a change. Eisen: we saw how sensitive the market is lately to any piece of global data. Got some green shoots out of china manufacturing, out of U.S. manufacturing. Are you seeing any early signs that we could be looking at a bottom in terms of the worst of the global growth picture? Too early? Lagarde: what we know for certain is the upswing that we forecast for late 2019 and early 2020 will have to do with country-specific cases. When you look at countries like Iran, Venezuela, Turkey, hopefully out of where they are now, which is very low, we might see a positive impact. But no. Unless trade tensions go away and go away for good and across the board, which would then clearly boost confidence which would clearly encourage investment. We are very concerned about this very delicate moment where policies are needed on all fronts. Eisen: you’ve mentioned trade tensions going away. Last time we spoke a few months ago, you were pretty optimistic that a deal would happen between the U.S. and China, that there was commitment to making a deal. What’s your level of optimism these days? Lagarde: well, a deal is a deal is a deal. And it’s only done when it’s signed, sealed and delivered as the old-style british lawyer would say. And it’s not there yet. I’m still optimistic, it’s my nature anyway. And there is a clear impetus, a clear determination on both sides to move forward. It’s vitally important because if there was no such deal, clearly there would be a very negative impact on both the Chinese economy but also the U.S. economy. We’ve done some modelization, and we figured, okay, if there was a 25% tariff increase on all trade between the two countries, U.S. And china, and there is a clear negative impact, -.6% on the U.S. economy, -1.5% on the Chinese economy. So given those are the two big giants currently, if you have that kind of negative impact on both, it would weigh heavily on the global economy and would be bad. Eisen: what would happen if we did get a trade deal, but some of the tariffs stay in place as have been threatened? Eisen: but would we see upside to growth? Lagarde: well hopefully, the first thing is to have less uncertainty, number one. Because the business community can adjust but they want to know how much, where it is, for how long. If there is a prospect that tariffs will eventually be removed over a period of time, maybe, that’s already less uncertainty. If they understand that there will be respect of intellectual property and enforcement of the rules, that’s less uncertainty. If they understand that transfers of technologies will be properly addressed and reduced in terms of expectations, that’s less uncertainty. All of that should fuel more investment, more trade, less of that trepidation that we see at the moment. Eisen: you mentioned partly because of trade, the global outlook has worsened, what about the U.S.? Is the U.S. still outgrowing the rest of the world? Lagarde: as I said, the movement of deceleration has affected all countries, including the U.S. was immuned to that for a period and in January, we did not downgrade our U.S. economy forecast. Now it’s pretty much across, as I said, 70% of global economy is affected by this slowdown. That’s what we are seeing, yes. However, you know, clearly the unemployment number is rock bottom. The markets are quite satisfied but that’s, you know, with a word of caution and I think there is a precarious moment which leads us to say delicate moment. Let’s watch out, make sure there’s no misstep of policies. Eisen: does the U.S. need a 50 basis point interest rate cut right now as the White House has suggested? Lagarde: at the IMF we highly respect the independence of central banks and central bank governors. So I think as long as it remains data dependent, well communicated so that there can be anticipation, that will be the right way to go. As we’ve said, you know, when inflation is too low relative to goals, when inflation is not anchored, yes, of course, they should be a commoditive monetary policy, but if it’s not the case, then no. Eisen: we’re not there, are we? Lagarde: data dependent to be decided by the fed as far as the U.S. monetary policy is concerned. Eisen: other central banks have really sprung into action so far this year. In Europe they’re sticking with the easy – even easier policy, bank stimulus, negative interest rates. Is that going to have an impact on the European economy? Lagarde: they do that if you look at the rational behind it. They do that because inflation rate is certainly not at the level where it is expected. They have this 2% expectations minus or plus, but 2%, close to. They’re not there at all. It’s much lower at the moment, both in terms of core inflation and anticipated inflation. So that’s the reason why they’re moving in that direction and it’s – we see that as completely legitimate. What we’re also saying is, monetary policy alone cannot address the current delicate moment where we are and it requires those, you know, fix the roof please, which means conduct the structural reforms that will boost productivity and that will support long-term growth. That is absolutely needed. Eisen: but how do you think about the longer term implications of negative interest rates for a very long time and what, for instance, Europe has done to its banking system? Lagarde: well, don’t forget the work that has been done over the last few years after the big financial crisis. A regulatory framework that has now been agreed pretty much across the board between U.S., Japan and Europe and others. The fact that, clearly, monetary policy has been pretty much left to its own in order to fix the situation, the fact that fiscal policies were not adjusted sufficiently rapidly. We contend that those that are in surplus or are at, you know, this black budget as the Germans call it, can actually afford to spend more to spend on education, to spend on broadband, to spend on infrastructure, while those countries that are in a more difficult situation and have rising debt have to be very cautious with that. So fiscal policy really needs to be adjusted. Those who can spend should spend. Those who need to continue to build fiscal buffers need to do that now and it is still counter cyclical to do so. When the next crisis comes about, they have some space to fight the next crisis. Eisen: do you see any way that the British government is going to be able to come out with a deal before April 12th without crashing out of Europe? Lagarde: I dearly hope so. I dearly hope so because the consequences of any kind of Brexit will not be positive and that’s an understatement, but absent a deal, it would certainly be very, very sad for the economic situation of that country and would have negative impact on consumers, on producers, on the supply chains, on pretty much all the trade relationship that exists currently between that country and the rest of Europe. Eisen: then finally, I just wanted to ask about another risk you’ve been warning about for a long time which is rising debt loads and the U.S. deficit and the fact that we’re back to a trillion dollar deficits both political parties in this country really are embracing spending. Why is that and why do you think that nobody’s realizing the danger? 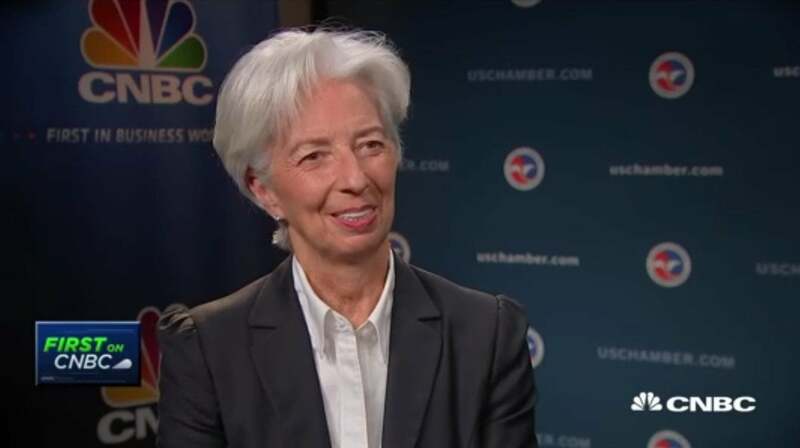 Lagarde: well, first of all, I think that you really have to look at the situation going forward. How much of those entitlements will come due as people age and will retire and will draw on public resources, number one. Number two, for how long are we going to keep those very, very low interest rates? For how long are markets going to be patient? Now clearly, the situation of the united states is slightly different because it has what a former french president called the exorbitant privilege of the dollar. So it gives clearly an edge over all the other countries. But having an excessive weight of debt is clearly hurting any economy and comes a point where interests will move around and where financial markets will lose patience. Eisen: Christine Lagarde, thank you very much.